And if there’s one thing I had learned with Women in Media, it was the importance of publicising your group. And you could do it sometimes with things that appeared to be gimmicks. Women in Publishing had nothing like that, but sitting around one day, some author had written something terrible, demeaning to women, terrible in that sense, and I don’t know who came up with the idea – you know, we really ought to do, you know we ought to do an award each year for the most anti-woman, anti- feminist book, or words to that effect. Yes, that’s a good idea! But then, I don’t know who came up with the title, which was The Pink Pig Award, and we said yes, yes, that’s brilliant. We’ll call it The Pink Pig Award. And we decided very quickly that what we would do is we would get a marzipan pig made up. I think it could have been Maison Bertaux, but one of the good bakers, which would be handed to the winner as his award. And this is all terribly frivolous, but we went through a couple of meetings asking for nominees and we came up with categories for a Book of the Year, Jacket of the Year, Book Reviewer of the Year, and Publisher of the Year. And having put this together at various meetings, at the AGM, we asked everybody to vote. And so the winners were voted on at the AGM from all the women who were there, which was probably, well over a hundred. And then we would put out our own Press Release saying ‘The winners of this year’s Pink Pig Award from Women in Publishing annually, are the following’ and list them, and send round our Pink Pigs. And we just thought this was going to get an inch or two somewhere or other. 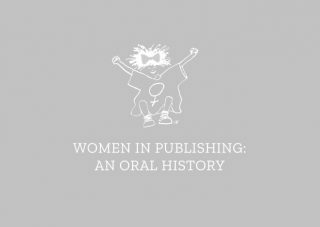 It was, all hell broke out and there was this vast correspondence that went on and on between Auberon Waugh, Anthony Burgess, Jane Gregory, ‘cos she was the one signing it on behalf of Women in Publishing. She was probably head of our Pink Pig Awards Committee and also me as the press person. And they both wrote about us by name and just, sort of, wouldn’t let go of it, making fun of us. It put us on the map though.